Make an easy nettle and oat straw tea infusion for a natural source of calcium and drink a cup daily as part of your arsenal to help strengthen your bones and nails. Before I started drinking this nettle and oat straw tea infusion remedy I looked at people who made their own herbal teas for health reasons as a little, you know…a little “out there.” Besides, I like regular tea – it’s my afternoon ritual that I look forward to and helps me stay at a healthy weight. When one of my sisters started brewing an herbal tea-infusion a year or so ago, drinking a quart of it a day, I couldn’t see how I’d ever fit that into my life – or why I’d want to. A doctor read my bone density test and said I “was very close to osteoporosis” and should start on a prescription regimen – for something that may never actually even develop (um, no, and I’m not seeing this doctor anymore- the constant push towards prescriptions for everything in medicine is really bothersome to me). Over the last two years (since the big “M” started) my nails had become so weak, brittle and full of ridges that I gave up growing them and just kept them short. That in itself was just irritating, but I also had a permanent split on my thumb nail that was in the pink part of the nail which would catch on things all the time and actually hurt. So a couple months ago I asked my herb-drinking sister if she knew of something that would help with these two issues and her suggestion was a nettle and oat straw (either two words or one: oatstraw) tea (actually it is an infusion since it steeps for hours instead of minutes, but I drink it like a tea, so that’s what I call it mostly). I did a bit of my own research and read that I didn’t have to drink a quart a day to gain the benefits of these herbs (which if you can, great, as they actually help with many more things that you can read about here). The arrow on the left shows the divot I filed where the split used to be – now grown out into the white part of the nail and not split at all. The two arrows on the right point to my weakest nails pre-tea which are now just as rounded and healthy as the others. They were so weak before that they actually grew flat and I could often peel them from the pronounced ridges. This is the first time all the nails on this hand have been this long all at the same time in a long time. 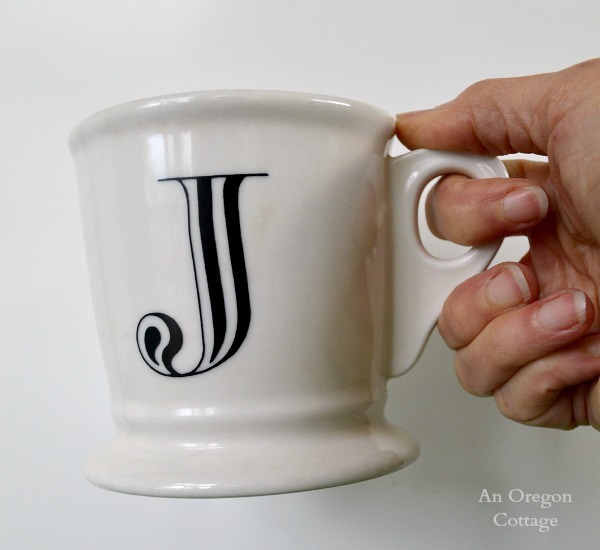 You can see I still have ridges that come with age (ah-hem…), but they aren’t as noticeable to the touch as they were and I’m hopeful the tea will continue to help minimize them. 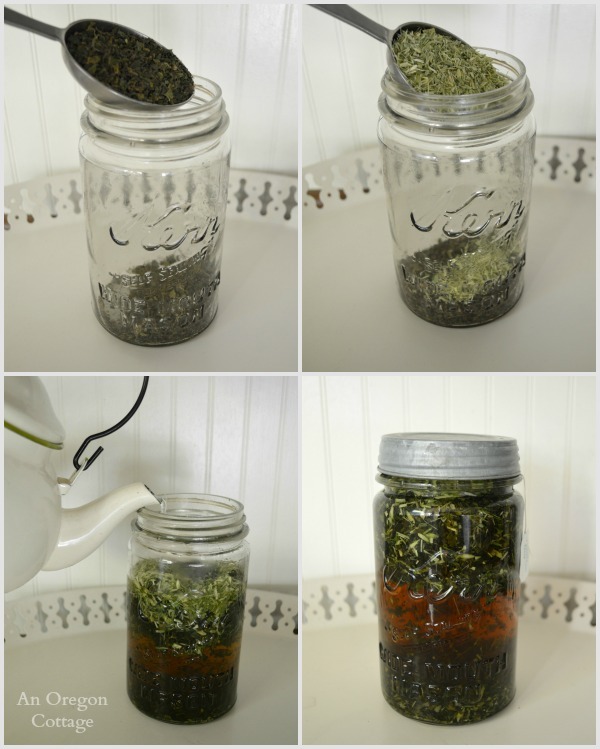 Add 1/2 cup of dried nettle leaves to a quart jar. Add 1/4 cup of oat straw to the jar. Bring a kettle of water to boil and fill the jar to the brim. Cover and let steep for as long as possible, up to 12 hours. Strain leaves, catching tea in a bowl with a spout, rinse out the quart jar and return strained tea to the jar. Store in fridge no more than 3 days. Drink half of the tea a day in a cup, drinking heated or iced as desired. It takes less that 5 minutes, total. I try to make it in the evening, let it steep overnight and then strain and fridge it in the morning so it’s ready for me to drink after lunch (which is where I’ve ‘scheduled’ it so I can still have my regular tea at 4:00). Sometimes that doesn’t happen and it only steeps from 8:00 am when (I realize I forgot) until 1:00 or so. My point is, it still works with less time to steep – the key seems to be more consistency, making sure to drink some almost every day, so do what you can to drink it each day. I add a bag of peppermint tea to the quart jar before step 3 above and let it steep with the other herbs (peppermint is well-known for it’s own benefits, as well, so it makes my infusion even better for you!). 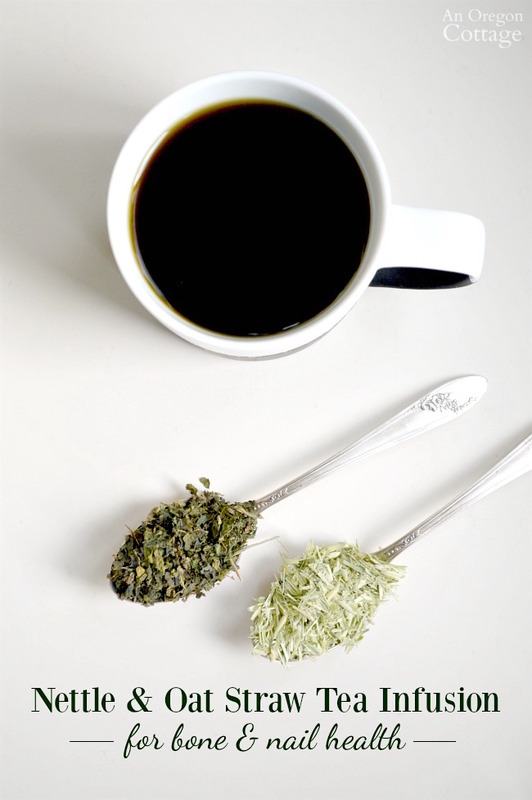 The nettle and oat straw tea doesn’t actually taste bad on it’s own – it’s hard to explain, it’s just dull and a bit strong, herb-wise (sorry – that makes hardly any sense, I know! 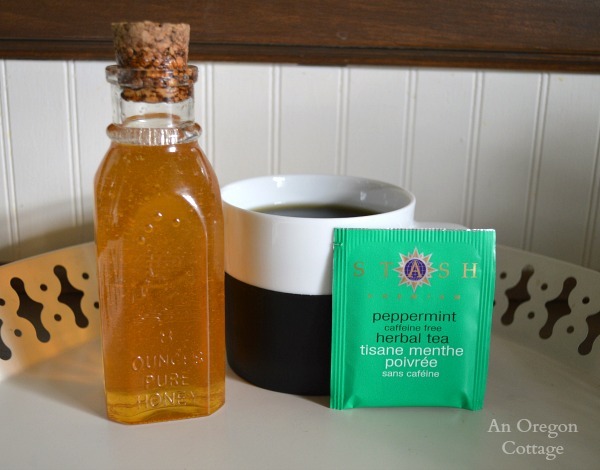 ), and the peppermint makes it seem like just a cup of peppermint tea. I also add about a half teaspoon of honey which helps me enjoy it more. I want to make this a part of my life and look forward to it after lunch, so it’s important to make it palatable. If you don’t mind drinking it straight – go for it! I should mention my sister adds rose hips for vitamin C and says it helps it taste milder. I plan to try this, too, but I still think I’ll need a bit of honey. Update: I now add the dried rose hips and LOVE it. I add between 1-2 TB. to the jar before adding the boiling water. The dried rose hips smell SO good and their vitamin C levels are higher than many fruits! Click here to see the dried rose hips I order from Amazon. When I find something that works so well for so little (kinda like the turmeric that has helped our dog), I can’t help but share it with you all in the hopes that any of you also dealing with nail issues or bone strength will benefit, too. 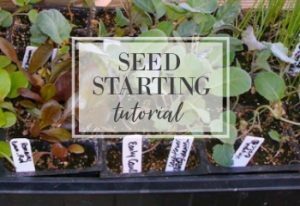 It’s one of the things I like most about blogs and blogging – our modern-day equivalent of sharing our stories, remedies, successes, and failures over the back fence. Please let me know if you try this and the results you see – I’m dying to know if it works for others like it did for me! This increased your blood calcium levels? From what I understand, that’s not a good thing. High blood calcium levels can be a precursor to heart problems. I had high levels on several consecutive blood tests and started taking Vitamin K-2 (MK-7) which helped. You want the calcium in your bones, not your blood. I don’t know that Vit. K did that, but it least it got the calcium out of my blood. Thanks for being honest with your addition at the top. I have read a lot about these infusions online, but I can find hardly anything from people saying that they work. I also read a lot of not-so-good info about the herbalist who is known for coming up w/ this idea. Big sigh. So thank you for saying that it didn’t work that well after all. It is so hard to sift through everything online, and also, I’d prefer tea to infusions, and I believe in doing using the smallest dose of herbs I need–so I’ll keep looking for anyone who has good health reports after using these infusions. If your bone scans improve, maybe you will post that. You may have already. I’ll check. Thanks! Yes, I love reading blog entries like this one! I know one person’s experience is not the end all be all, but I do love reading them, and I am actually drinking nettles and oatstraw teas these days. Why not, and it feels good to think I am living closer to the earth. 🙂 Thanks! You mentioned that osteoporosis was one of your initial motivations for considering oat straw and nettle tea. Are you still drinking your daily concoction, and has it made any difference in your osteoporosis? Thanks! By the way, I recently started drinking a daily tea made of nettles, oat straw, and horsetail, mainly because my nails had become very weak. I’m just making a cup at a time by steeping the herbs for 15 minutes or so, but I’ll give the overnight method a try – in theory, I suppose it will release more of the vitamins and minerals into the tea. I was encouraged to read that you saw improvement in your nails so quickly. That’ll encourage me to stick with this for at least a month! I am still drinking it, and adding rose hips for vitamin C now. I haven’t had another bone scan (x-ray + cost makes me want to do them only when needed), so I don’t know exactly, but I’m doing all I can to help my bones, so I’m hopeful. (note- I didn’t have osteo – just the precursor) I also make sure to get omega-3s in fish, flax, and walnuts, eat canned fish with bones, and add things I read that are good for bone health (like dried plums!). I think you will see a difference, though it didn’t keep working so amazing for me. The thumb split came back. 🙁 I started brushing my nails with a strong top coat and between the two (tea and top coat), they’ve stayed strong for almost a year now. Susun Weed says to use an ounce by weight of the nettle leaf which is roughly one cup. It’s possible that you’re not using enough which could account for your nail split returning. Just thought i’d share that. Good luck! I started this concoction abt 6 days ago. Only I use a cup of oat straw to a qt and a cup of nettle to another qt jar….so may try your strength as it wld save on herbs…. Anyway I drink mine cold but I also infuse mint and lemongrass with it…. Seems to help that grassy taste. May add one of this natural little tea bags in the store also … I like passion fruit. But I bought it for hormone and the energy that I hv read it cld help. But I also hv nail problems like your and did not realize it cld help with that…I had given up having pretty nails! I can’t wait for my month to be over to see what results I get with this! GLUTEN- I have an allergic reaction to Gluten. If you buy the Oat Straw from a reputable source, it should not be cross contaminated with Gluten. Usually wheat fields are planted right next to oat plants and when the wind blows, the oats get contaminated. Reputable herb shops don’t use oats that are planted next to wheat. Hello, I made one batch of this and drank it without adding flavor to it. It’s not the tastiest but i chugged it down. Question though, is Oat Straw a grain? Gluten free? I am Paleo so you know what that means. Thank you for getting back to me! I really want to try this again. I guess I will and see what happens. How much rose hips does your sister add? I just got my herbs ordered tonight. Can’t wait to get started on this! For a quart jar, are you actually adding 1/2c nettle and 1/4c oatstraw? That is a ton of leaves. You mentioned that you were half way through a one-pound bag after 2 months. If you are making a quart jar every 3 days, you would make 20 times within 2 months. Looking at the one-pound bag (of each herb) I just got, I am not sure they would last that long. Just want to clarify before I start making the infusion. Thanks for sharing and I have always enjoyed the DIYs on your website. Yep, that’s what I do – It fills the quart jar about 1/4 of the way, as pictured, Sophie – thought it doesn’t seem to be a ton to me. And I don’t know all the measurements, but the bags I bought last November are still going strong! I was just thinking I’ll need to order more for my March order from Amazon, so the bags will last abut 5 months. 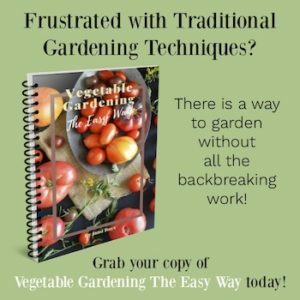 I hope that helps your planning some! I just found this post as I googled “nettle tea help nails”. Your readers may be interested in my experience. A month ago I started drinking nettle tea for another reason, and just realized this morning how much my nails have recently improved! the nettle tea was the biggest recent change in my in my diet. So I have noticed a change without any preconceived notions about change or improvement. 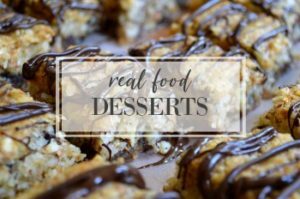 I am definitely convinced, and will add the oat grass when I source some. Thanks for your post! Oh, yes, I love hearing that your results were like mine, Judith, ’cause that means it wasn’t just random – thank you for commenting on your experience. There’s nothing like quick results to get you motivated to make something a habit – I hate to go a day (like when traveling) without my tea now. I’m literally daily amazed at how strong my nails continue to be! I just mixed up my first batch and will try it this evening. I also took your idea of taking a before picture of my currently slit nail. Good idea, Jen – I’ll be anxious to know if it works for you like it did for me! I just tried some of the tea. The first few sips were pretty grassy tasting. But I left it for a while and came back to finish it later and it was better cooled off. I’m glad you suggested mint & honey. I put the honey in with the mint and other herbs before the boiling water so it would dissolve right away. The last half of my cup of tea I chugged. The last bit was very minty so that definitely helped. I’ll post back here if I start seeing results. Perfect timing!! Thank you so much. I have hypothyroidism and it surprised me just after menopause. Not only did the nail problem start, but also some thinning of hair – which I hate. I was reading that silica can help with the hair problem, so wouldn’t it be great if Oatstraw and Nettle tea addressed both problems! Do you heat the tea before you drink it or do you drink it cold and do you think it matters? How nice to have a sister who is knowledgeable on herbs! I hadn’t thought about the hair-nail connection, Esther! Oh, I hope you are right and it works for thinning hair, too – that would be awesome for my thinning hair, too. 🙂 I look forward to hearing your results and I’m going to keep an eye on my hair, now, too! My nails started splitting after chemotherapy. I was around ten years post menopause. I am so glad to have this information. After I see the Dr. I will be ordering the makings for this tea. I tried Biotin but it did nothing for my hair or nails. It cut off some of my reply. Anyway- have a Happy New Year! Thanks for posting about this. I’ve looked online and hadn’t found even any description of split nails that looked like what mine are doing, until this post. did the splits in your nails catch your hair when washing and catch on fabrics and edges of other things? I’ve developed cracks in several different nails at different times. Sometimes one will fuse back and a different one will split. So I have thought it may be nutritional, but haven’t been able to figure out what makes it better sometimes. I may try the tea/infusion, but I don’t like or drink tea :(. (Either hot or iced). So I’ll probably need to try adding the peppermint and honey. Oh, and one thing I didn’t mention much in the post was diet and nutrition – I have a fairly good diet (I’d say 80%-20% for sure, many days 90%) with very limited processed foods. 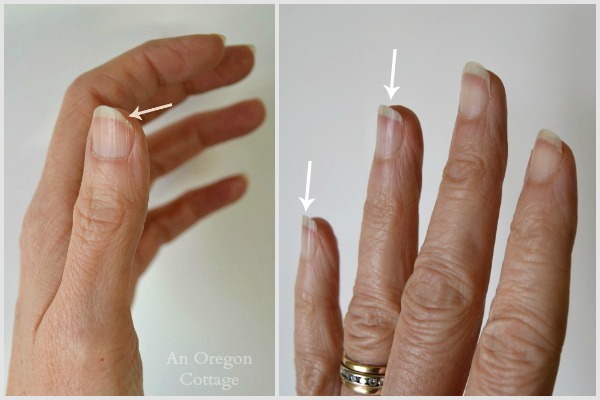 This nail problem was a direct result of menopause, when the changes in hormones cause more mineral depletion than normal. I can’t eat MORE food and keep my weight stable, so adding supplements like this is the way to combat minor problems like this for me.